Scientific evidence indicates that an individual’s response to nutrition and propensity to disease is linked to his or her genetic makeup or “genotype” This may explain why, in the past, studies of nutrition often produced seemingly conflicting results. Genetic responses were seldom taken into account. Therefore, the department’s research examines how an individual’s ability to metabolize components of food—carbohydrates, proteins, fibre, fats, fatty acids and vitamins—is related to genotype and propensity to disease. Genotyping has rapidly become a relatively inexpensive diagnostic tool, opening up new possibilities for its use in guiding nutrition. In the future, it may be possible for individuals to take advantage of a simple blood or saliva test to learn which foods will keep them healthy and which they should avoid. 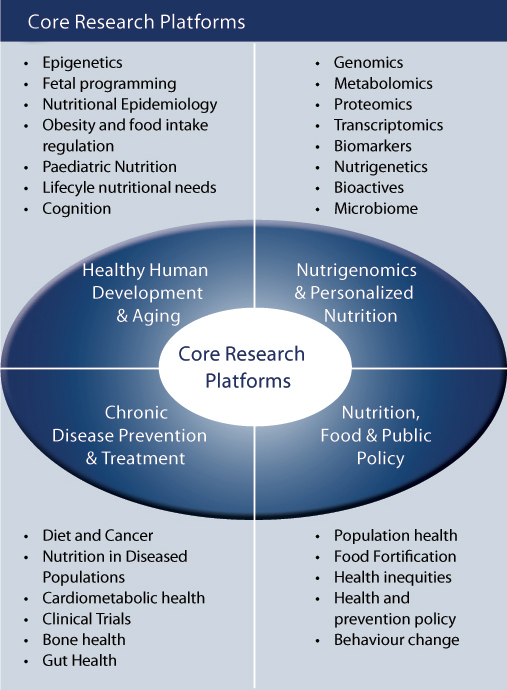 Outcomes of this research can lead to better formulations of processed foods, dietary guidelines for entire populations, and individual guidelines according to genotype and disease status, i.e., what individuals should eat to maintain wellness or to combat illness. The department is exploring the links between our nutritional environment in the womb and how our phenotype responds, particularly the epigenetics22 and fetal programming23 that occurs during the pre- and post-natal developmental period—a critical window that can influence one’s susceptibility to the chronic diseases of adulthood. The department is examining aspects of the links between diet and heart disease, diabetes and cancer. A particular focus is on how foods and bioactive components, such as novel fibres and proteins, can be used to prevent and/or treat diseases or act as an adjuvant during treatment. The department is strengthening research that can be used for evidence-based policy development and translated into population health policies.